The first Bentleys were powered by a sophisticated three-litre, four-cylinder engine. Fitted with a four-valve head, the relatively small engine managed to punch well above its weight, underlined by two Le Mans wins. W.O. Bentley, however, quickly realised that to attract the most discerning of customers the sheer size of the engine and the number of cylinders were the deciding factors. So he set about creating a six-cylinder version of the existing engine during the mid 1920s. The first six-cylinder Bentley engine built was effectively the existing 'four' with a further two cylinders added for a total displacement of 4.5 litres. Shortly after this engine was ready for testing W.O. Bentley had a chance encounter with the prototype of the new Rolls-Royce Phantom, which had a much larger engine still. As a result, he went back to the drawing board to create a considerably larger version of the prototype six-cylinder unit. The engine was bored from 80 to 100 mm for a total swept volume of just under 6.6 litres. Like the 'four' it was derived from, it featured an advanced four-valve head with a single overhead camshaft. The cylinder head itself was cast in one piece with the block, so no head gasket was needed. Equipped with a single Smiths carburettor, the new engine produced close to 150 bhp. It was mated to a four-speed gearbox and mounted in a conventional steel ladder frame chassis. 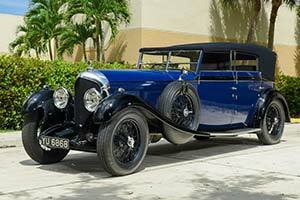 Dubbed the 6½ Litre, the new Bentley was launched in 1926. It was available as a rolling chassis with a wide variety of lengths to suit the customer's coach-building needs. While the smaller 3 Litre was often ordered with sporting open bodies, the 6½ Litre usually featured more formal saloon and limousine bodywork. From 1928, the range was expanded with the more powerful Speed Six model, which also proved hugely successful on the racing track. Between 1926 and 1930, Bentley produced 544 examples of the 'standard' 6½ Litre (362) and the Speed Six (182) combined. In 1930, the two models were replaced by the even larger 8 Litre model, which proved the swan song for the W.O. era Bentleys.